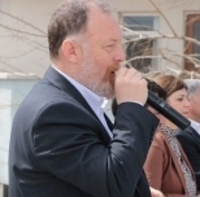 Peoples' Democratic Party (HDP) Co-Chair Sezai Temelli has visited Eruh in Siirt province for his party's campaign ahead of the March 31 local elections. Criticizing the Hürriyet newspaper, which distorted his words on the elections, Temelli said, "Had the press been free in this country, the people would not be subjected to so many lies." "Don't make stories out of the words that we didn't utter"
"Don' distort our words. Don't make stories out of the words that we didn't utter. Look, did CNN (CNN Türk TV), Hürriyet, TRT (state-run TV) come here? "No. They found the easy way; sitting at their desks, treating the HDP and the Kurds as enemies, making special news for the government. They are not able to do anything else. But the truth is here, in Eruh." "Had the press been free..."
"Come here and listen to the truth! Do journalism. This country has suffered the greatest pain because its media is not free. Had the press been free in this the people would not be subjected to so many lies, this country would not be dragged into this bad situation. "This many journalists would not be in prisons. Those who call themselves journalists, those who work for the partisan media, don't you feel the slightest twinge of guilt about that? Don't you have any moral problems? Aren't you aware of what is called the press ethics that you do so many fabricated stories? What did Temelli say, what did Hürriyet write? "Mansur Yavaş (main opposition CHP's İstanbul mayoral candidate) will know that if he is elected, he is elected with HDP's votes. He cannot do politics ignoring the HDP, the Kurds, he cannot do politics ignoring the people of Ankara. And this is our power. "If Ekrem İmamoğlu (CHP's İstanbul mayoral candidate) is elected, he will be elected with the votes of the 3 million Kurds who live in that city. He will know that he cannot do politics despite the Kurds." The media outlets owned by the Demirören media conglomerate, CNN Türk TV, Posta and Hürriyet newspapers, distorted Temelli's words. Hürriyet published the story with the title, "Open Threat and Confession by HDP Co-Chair Sezai Temelli: 'Not İmamoğlu and Yavaş, but HDP will rule İstanbul and Ankara." "They steal one million of our votes"
"Put an end to doing harm to this country. Put an end to dividing and tearing up this country. "This is persecution, this is a shame, this is a sin. They are kicking 20 million Kurds out of this country. Not satisfied with this, he says, 'HDP are terrorists'. Not satisfied with this, he spreads this to all people. "Farmers, grocers, craftspeople are becoming terrorists. He is unable to slow himself down, almost all the country are terrorists. "He says "You are disbelievers, you are faithless," to 7.5 million people who cast their votes for this party. The polls say 6.5 million but they steal one million of our votes. This is unacceptable." "Where is a president seen who says 'Get the hell out' to his own people? Where is a president seen who calls his own people 'disbelievers, faithless'? Where is a president seen who calls his own society 'terrorists'? "It is seen nowhere. The president of a country should approach all its citizens equally, he/she should embrace everyone. Do you see such a president?" "Election propaganda through the massacre of 50 people"
"Can the massacre of 50 people be used as propaganda material for elections? Here is the example of New Zealand. Fifty innocent people were massacred there, while they were doing their prays. Can this be used as propaganda material for elections? "Altogether, we will challenge this, damn this and do our part for this to not happen again. But today, those who make the religion an instrument for politics, show this massacre on screens, fueling discrimination. "Look, three people lost their lives in the Netherlands today. Once more, I wish God's mercy for those who lost their lives in the Netherlands and New Zealand." "This is a right struggle; this is legitimate, legal. They demand the laws be implemented. They call out the Minister of Justice. PENNED BY ANDREW GARDNER FROM AMNESTY INTERNATIONAL: Purged Beyond Return? Comments Off on PENNED BY ANDREW GARDNER FROM AMNESTY INTERNATIONAL: Purged Beyond Return?